In this follow up to the magnificently inventive Ice, Arthur Geisert once again charms us with his porcine world. This time his pigs must get creative when a volcano destroys their home. 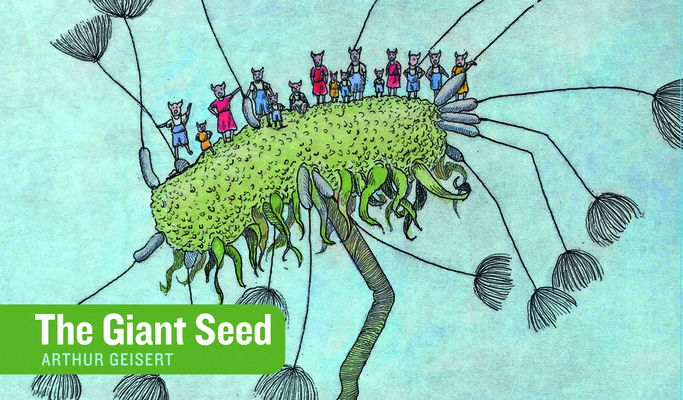 Fortunately they got busybefore trouble hit by planting a huge mysterious seed, for it's the seed plus imagination, as well as a good dose of can-do spirit, that save the day Illustrated with inventive, sensitive, and unusually lovely etchings that seem to come from an old cherished album, The Big Seed is a worthy successor to Geisert's Ice. Award-winning children's book author Arthur Geisert's pigs are legendary in the world of children's books. They carve ice sculptures, teach Roman numerals, create ingenious machines, and get up to all kinds of antics. Did Arthur grow up on a farm? No. He grew up in Los Angeles and claims not to have seen a pig until he was an adult. Trained as a sculptor in college, Geisert learned to etch at the Otis Art Institute in Los Angeles. He has published just about a book a year for the past thirty years and every one of his books has been illustrated with etchings. In 1996 (as well as once previous to that) he won The New York Times Best Illustrated Award. Geisert lives in Bernard, Iowa. Arthur Geisert: Award-winning children's book author Arthur Geisert's pigs are legendary in the world of children's books. They carve ice sculptures, teach Roman numerals, create ingenious machines and get up to all kinds of antics. Did Arthur grow up on a farm? No. He grew up in LA and claims not to have seen a pig until he was an adult. Trained as a sculptor in college, Geisert learned to etch at the Otis Art Institute in LA. Geisert has published just about a book a year for the past 30 years and every one of his books has been illustrated with etchings. His work has appeared in The New Yorker and the Horn Book magazine. In 2010, his book ICE (also published by Enchanted Lion) was selected as a New York Times Book Review Best Illustrated book of the year. Geisert currently lives in a converted bank building in Bernard, Iowa.